As we know, snapchat is an self-destruct messager app, the message that we send will disappears a few seconds after it’s received and viewed by the recipient. The essence or the main function of snapchat will be lost when we want to replay the messages that have been deleted. That moment was so worthless, the message that should have only once seen now you can see many times using the replay feature on snapchat. Here’s how to do free replay for iPhone users, and also how to purchase paid replays by using Apple store. In its latest update, now you can replay a snapchat from your friend, but you can only replay the snap just once a day for free. If you want to replay more, you need to purchase it. 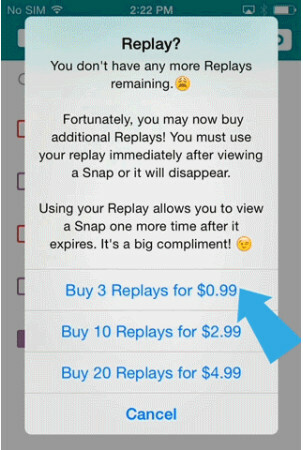 The additional replay on snapchat will cost $ 0, 99. It seems snapchat use this way to get more money than using advertising. Say, you just recieved this one fascinating snap from your crush and you don’t want it to dissapear forever, but you forgot to take a screenshot, don’t worry you can replay it. After you finished watch the snap, it will dissapear right? as soon as it dissapear, tap and hold on that snap you want to replay, then tap the snap and it will show up again, but remember, this only work for fresh snap, the snaps that you just viewed, not for older snaps. To purchase additional replay, you need to have Apple ID, and make sure app stores are avaliable on your country. After your free replay is run out and you tap it to replay again, you will see this pop-up to offer you paid replays. Choose on how much you want it so bad to replay. When you are logged in, there will be a confirmation to continue your purchase, after you confirm to lose your $0.99 for three replays, you will able to perform the replays, congratulation! Just like when you take a screenshot, your friend who give you a snap will get a notification when you replay the snap, yeah it’s kind of embarrassing. 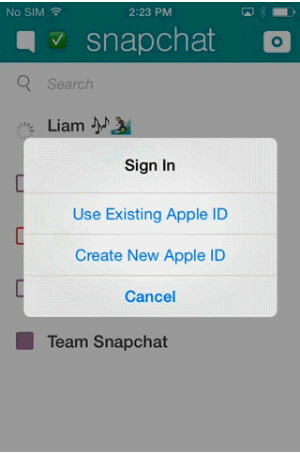 Share to your friend so they will also find out how to replay a snapchat on iPhone, so maybe they are gonna replay your silly snaps over and over again.